Irish by birth, John Field gained an international reputation as one of the finest pianists of his time, with an influential delicacy and nuance in his playing that is expressed in his innovative and poetically lyricalÂ Nocturnes. Field’s earlierÂ SonatasÂ are more classical in feel, but their sense of flow and dramatic narrative exhibit qualities that are developed and given added virtuoso panache in his fineÂ Piano Concertos, works admired by Liszt, Chopin and Schumann. 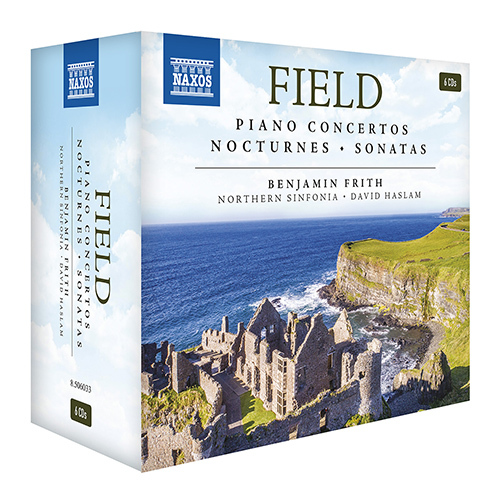 ‘Benjamin Frith has done a stellar job in bringing these concertos into the sunlight, brilliantly supported by the Northern Sinfonia under David Haslam’ (PianistÂ magazine).